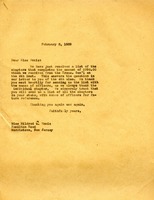 The letter expresses thanks for the total donations of the Daughters of the American Revolution and records them individually. It also informs the national office that the school will also be writing individually to each chapter. 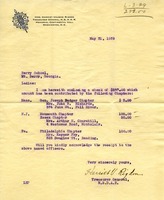 In this letter Harriet Rigdon sends a check from the national DAR along with the addresses of the donors. Martha Berry lists the gifts Berry has received from 7 DAR chapters, through the DAR Treasurer General, and gives thanks to the state treasurer and the Chapters. 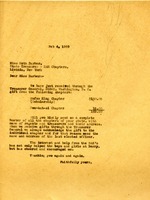 Letter to Mrs. Bonnie A Pattison thanking her for the $175 donation from the DAR. 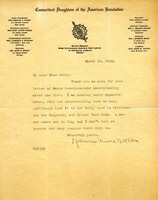 Martha Berry writes to Miss Loomis to thank her and acknowledge the receipt of funds from the DAR. Miss Berry is writing to inform the DAR Treasurer of gifts they have received from different chapters and thanks her for the DAR's support. 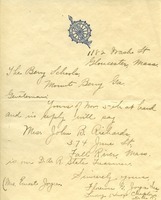 Martha writes to Miss Ennis about the funds that have been recieved from New Jersey Chapters of the DAR and asks for the names so the school can thank them individually. 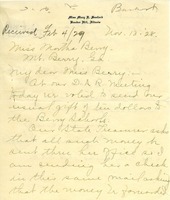 In this letter Martha Berry thanks Miss Ennis for the list of donors from the DAR and asks that she continues to send the names of the officers. 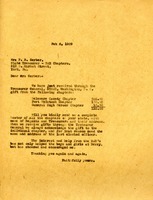 Martha writes to Mrs. Gerber with a list of the chapters that they have received gifts from. Martha asks for a complete list of all the chapters in the states so that they may acknowledge individual chapters for gifts they may receive. 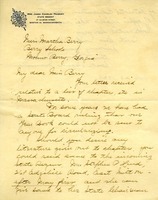 In this letter Martha Berry thanks Miss Barber for the donations from the various DAR chapters. 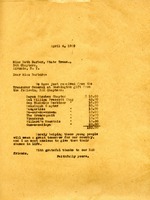 In this letter Miss Berry names the New York DAR chapters through which they have recieved donations. She asks Miss Ruther Barber (treasurer) for a complete roster of all of the New York chapters in order to acknowledge the gifts individually.